For other uses, see Protagonist (disambiguation). Look up protagonist in Wiktionary, the free dictionary. A protagonist (from Ancient Greek πρωταγωνιστής (protagonistes), meaning 'one who plays the first part, chief actor')  is the leading character of a story. The protagonist is at the center of the story, makes the key decisions, and experiences the consequences of those decisions. The protagonist is the primary agent propelling the story forward, and is often the character who faces the most significant obstacles. If a story contains a subplot, or is a narrative made up of several stories, then each subplot may have its own protagonist. The protagonist is the character whose fate is most closely followed by the reader or audience, and who is opposed by the antagonist. The antagonist will provide obstacles and complications and create conflicts that test the protagonist, thus revealing the strengths and weaknesses of the protagonist's character. The earliest known examples of a protagonist are found in Ancient Greece. At first, dramatic performances involved merely dancing and recitation by the chorus. Then in Poetics, Aristotle describes how a poet named Thespis introduced the idea of one actor stepping out and engage in a dialogue with the chorus. This was the invention of tragedy, and occurred about 536 B.C. Then the poet Aeschylus, in his plays, introduced a second actor, inventing the idea of dialogue between two characters. Sophocles then wrote plays that included a third actor. A description of the protagonist's origin cited that during the early period of Greek drama, the protagonist served as the author, the director, and the actor and that these roles were only separated and allocated to different individuals later. There is also a claim that the poet did not assign or create the protagonist as well as other terms for actors such as deuteragonist and tritagonist primarily because he only gave actors their appropriate part. However, these actors were assigned their specific areas at the stage with the protagonist always entering from the middle door or that the dwelling of the deuteragonist (second most important character) should be on the right hand, and the tritagonist (third most important character), the left. In Ancient Greece, the protagonist is distinguished from the term "hero", which was used to refer to a human who became a semi-divine being in the narrative. Euripides' play Hippolytus may be considered to have two protagonists. Phaedra is the protagonist of the first half, who dies partway through the play. Her stepson, the titular Hippolytus, assumes the dominant role in the second half of the play. In Ibsen’s play The Master Builder, the protagonist is the architect Halvard Solness. The young woman, Hilda Wangel, whose actions lead to the death of Solness, is the antagonist. 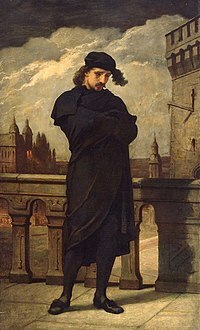 In Shakespeare’s play Romeo and Juliet, Romeo is the protagonist. He is actively in pursuit of his relationship with Juliet, and the audience is invested in that story. Tybalt, as an antagonist, opposes Romeo and attempts to thwart the relationship. In Shakespeare’s play Hamlet, Prince Hamlet, who seeks revenge for the murder of his father, is the protagonist. The antagonist would be the character who most opposes Hamlet, Claudius (though, in many ways, Hamlet is his own antagonist). Sometimes, a work will have a false protagonist, who may seem to be the protagonist, but then may disappear unexpectedly. The character Marion in Alfred Hitchcock's film Psycho (1960) is an example. A novel that contains a number of narratives may have a number of protagonists. Alexander Solzhenitsyn's The First Circle, for example, depicts a variety of characters imprisoned and living in a gulag camp. Leo Tolstoy's War and Peace depicts fifteen major characters involved in or affected by a war. In some cases, the protagonist is not a human: in Richard Adams' novel Watership Down, a group of anthropomorphised rabbits, led by the protagonist Hazel, escape their warren after seeing a vision of its destruction, starting a perilous journey to find a new home. ^ πρωταγωνιστής, Henry George Liddell, Robert Scott, A Greek-English Lexicon, on Perseus Digital Library. ^ "protagonist". Dictionary.com, Random House. Retrieved November 17, 2017. ^ Harper, Douglas. "protagonist". Online Etymology Dictionary. ^ "Protagonist - literature". Encyclopaedia Britannica. 1 April 2016. ^ a b Storey, Ian; Allan, Arlene (2008). A Guide to Ancient Greek Drama. Malden, MA: Blackwell Publishing. p. 84. ISBN 1405102144. ^ Telias, Rozei (2018-07-06). Moreno's Personality Theory and its Relationship to Psychodrama: A Philosophical, Developmental and Therapeutic Perspective. Routledge. ISBN 9781351021081. ^ a b Bart, M. P. (2018-03-22). History of the Literature of Ancient Greece. Charles River Editors. ISBN 9781632956316. ^ The Solzhenitsyn Reader: New and Essential Writings, 1947–2005: Aleksandr Solzhenitsyn, Edward E. Ericson, Jr., Daniel J. Mahoney. ^ Moser, Charles. 1992. Encyclopedia of Russian Literature. Cambridge University Press. pp. 298–300. ^ Adams, Richard, 1920-2016. Watership Down. London: Rex Collings Ltd, 1972. Print.